Konosuke Matsushita Panasonic Electronic is Japan's top appliance and consumer electronics maker (it is larger than Sony). By some measures it is (or was) the world’s largest consumer electronic maker and is one of Japan's largest and most famous companies. Based in Kadoma City, Osaka, it has hundreds of subsidiaries and has made products that have been sold under the names Matsushita, Panasonic, Technics, Quasar, JVC and National. 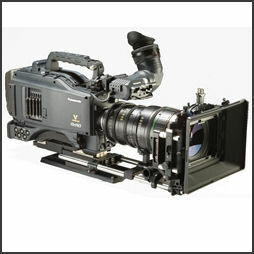 Panasonic makes Lumix cameras and Viera televisions and is the world’s biggest maker of plasma TVs. Panasonic is currently a major producer of flat screen television, automotive electronics and semiconductors. It is one of the few companies to make healthy profits in the flat screen televison business. In 2010, Panasonic retained its lead in international patent filings with 2,154. ZTE Corp, China’s second biggest maker of phone network equipment was No.2. Panasonic made a group net profit of about $850 million in fiscal 2010-2011, against a lose of $1.18 billion the previous year. The company robust sales offset the yen’s strength and the impact of the earthquake and tsunami in March 2011. Panasonic saw its net losses narrow in fiscal 2009 and was back in the black in the period from April 2010 to December 2010. As of 2011, Panasonic had 380,000 employees. It said at that time it planned to cut 30,000 workers by early 2013. It had cut about 10,000 workers in 2010. In 1917, at the age of 22, Matsushita quit his job at the Osaka Electric and started his own company with $50 in savings and $50 in loans in the larger of two rooms in his rented house. 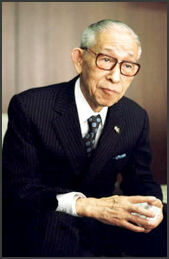 Matsushita worked with his brother-in-law, Toshio Iue, the founder of Sanyo. Their first product was a two-way light socket that was a big seller. Known as the "God of Management," Matsushita believed that practical experience was important. He worked at almost every job in his company---on the assembly lines, in the accounting office---even emptying trash cans. He also reportedly consulted a fortune teller on important business decisions. Matsushita lived in Nishinomiya in Hyogo Prefecture. Located on a 6,100-square-meter lot, his house had 20 rooms, including shoin-style traditional Japanese rooms and a Western lounge in addition to a spacious Japanese garden. The house was started in 1937 and took 1.2 years to construct. It took so long because Matsushita wanted it to be a typical Japanese structure built to last 300 years. Matsushita and his family lived in the house mainly before World War II. Late Zen master Taiki Tachibana, a prominent figure in Buddhist circles in Kyoto, reportedly told Konosuke Matsushita, the late founder of home appliance giant Panasonic Corp., to his face: "Because of you, Japan has become an awful place [with people] losing their compassion and only seeking material gratification. This must be corrected under your responsibility." This episode was recounted in the book "Cha no yu gatari, hito gatari" (stories of tea ceremonies and people) written by then Hakuhodo Inc. President Michitaka Kondo, who was present at the tea ceremony in the autumn of 1975. In the book, published by Tankosha Publishing Co., Kondo recalled that Matsushita remained amiable and appeared to be deep in thought after this rebuke. Four years later, Matsushita founded the Matsushita Institute of Government and Management to nurture human resources with the skills to manage state affairs. Yoshihiko Noda, 54, who later became Japan’s prime minister, was in the institute's inaugural class. three-way plug In 1918, at the age of 23, Matsushita founded Matsushita Electric and moved into a two-story house and converted the three rooms on the bottom floor into a workshop where Matsushita, his wife and brother-in-law made plugs and bases for electric fans. By the end of 1918, the company had 20 employees and was producing 5,000 plugs a month. In 1923 Matsushita, invented a dry-cell battery for bicycles lamps that lasted 30 hours, or 10 times longer than existing batteries. By the end of that year the company was selling 5,000 batteries a month. By the end of 1929, it was selling 150,000 bicycle lamps a month as well as batteries, irons and other products. bicycle lamp When the Depression of 1929 hit Japan, Matsushita defied conventional wisdom. He didn't lay off any workers or reduce their pay. Instead he gave them their full salaries for working a half day in their factories and spending the rest of the day going out and encouraging people to buy Matsushita products. The strategy worked, The workers ended up being very determined salesmen. Within half a year sales rebounded to normal levels. Matsushita began producing radio receivers in 1930. By 1934, it was Japan's largest producer of radios. It also made electric fixtures, cooking heaters, storage batteries, phonographs and motors as well as bicycle lamps and batteries. In 1936, it began producing incandescent light bulbs. Matsushita Corp., like every other company in Japan, participated in war efforts during World War II. Konosuke Matsushita was originally supposed to be ousted from Japanese industry for his involvement in the war but was removed from the list after Matsushita employees petitioned the Americans for his removal from the list. During the 1950s, 60s and 70s, Matsushita expanded its consumer products divisions and began making transistor radios, televisions, stereos, tape recorders, microwave ovens and video tape recorders. In 1952 it made its first black-and-white television. In 1960 it produced the first color television in Japan. In 1974, it purchased Motorola's television operation in the United States and Canada. It sold 100 million televisions by 1985; 200 million in 1998 and 300 million in 2008. Panasonic was the first television maker to produce 300 million televisions. By 1976, Matsushita had 83,000 employees and 500 subsidiaries. It was the world's largest producer of televisions, the sixth largest industrial corporation in Japan and the 30th largest industrial corporation outside the United States. Matsushita words of wisdom Panasonic prides itself on its corporate culture and looking after its employees. A favorite catch phrase for the company is that it has built people not just products. Matsushita was the first Japanese company to give workers a five-day work week, provide equal pay for women and develop a corporate spiritual philosophy. It sponsors classes in flower arrangement and meditation and other things for its employees and hosts sporting events. Matsushita has had few labor disputes and never had a strike. Matsushita encourages employees to offer suggestions on how to improve productivity. In one year there were 800,000 suggestions. It also set up a "self-control room" outfit with bamboo staves and a dummy of Konosuke Matsushita workers could use to take out their frustrations. The room also had distorted mirrors to help employees to relax. Young Panasonic workers and engineers do well in national and international skills competitions in categories such as lathe work, machine assembly and sheet metal working. In the machine assembly category, competitors produce about 10 machine parts and assemble them time within seven hours based on a assigned design. A trade school in Kadoma Osaka trains workers and engineers for these competitions. Grow industry, grow, grow, grow! Panasonic has long had a reputation for being slow to move and adapt and lacking innovation. It instead copied designs and products of competitors and introduced its versions as the products became popular. In the mid-1990s, malfunctions in a series of Panasonic products prompted the company to inspect and repair 430,0000 defective refrigerators and televisions for problems. At the same time Panasonic was unable to develop imaginative products. The period opened up the firm to criticism and set off soul searching within the company. During the recession of the 1990s, Panasonic fortunes began to decline and the company’s long cherished principals were changed. The company began moving more and more of its operations overseas, particularly to China, and shifting employees to profitable sectors. There was a discussion of laying off workers but a great effort was made to get employees to change their work habits and modernize or take early retirement rather than lay them off. There was even some talk that Panasonic might move its headquarters from Osaka to Tokyo. Panasonic has a huge production facility in Hangzhou, Zhejaing Province in China. Factories there make everything from washing machines to rice cookers for markets in China, Japan and elsewhere. “Panasonic bought a controlling stake in Sanyo, Japan’s largest maker of rechargeable batteries, in 2008 and made it a wholly-owned company last year to accelerate its expansion in battery businesses. It also merged Panasonic Electric Works, which makes lighting systems, electrical wiring fittings and electronic materials in 2011.
professional camera In early 2008 Matsushita announced it was changing its name and its National product line to Panasonic. The name change was approved by shareholders in June 2008 and went into affect in October 2008 with a speech by the company’s president to “make a fresh start.” In Japan suddenly the television filled with Panasonic ads which in the past would have been for National. 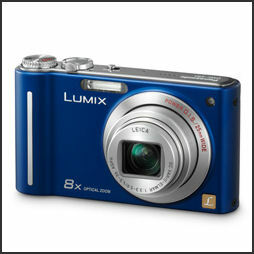 By the end of March 2010, all of the company’s products will carry the Panasonic name. Panasonic spent an estimated $400 million on the name change. One of the biggest expenses was changing all the signs from National to Panasonic at the 18,000 outlets in Japan that sell Panasonic products. The military also covered the cost of changing employee business cards and company pins. Panasonic has used name of its founder and the brand name National for more than 80 years. Behind the name change to Panasonic was the belief that strengthening its corporate brand image was essential to competing effectively in a highly competitive global market and distancing itself somewhat from the Matsushita way of doing things. The move was taken as markets in Japan were weakening and the future move than ever lie in selling products abroad. Panasonic lags behind Sony in international recognition. In a survey by a British market research firm, the Panasonic brand name came in 78th, much lower than rivals such as Samsung, 21st, and Sony, 25th. After death of Konosuske Matsushita, the company founder, in 1989, the Matsushita family demanded that the top post in the company and other executive positions be assigned to family members. The issue caused some friction between the Matsushita family and top executives with the company. In 2000, Kunio Nakamura, know for his business skill and smarts, was picked as president. Many though that Masuya Matsushita would be picked. Nakamura took drastic measures by slashing the workforces and scrapping the “hallowed” division structure established bu Konosuke. Since them Masayuki has been mainly active with the business community in the Osaka area, seen as sign that ties between the feuding family and management are stressed. Nakamura served as Panasonic’s president from 2000 to 2006. He implement an aggressive restructuring plan that reduced the workforce by 20,000 employees. The company posted large losses in fiscal 2001 but recovered after that. Fumio Otsubo became Panasonic’s new president in June 2006. He is an Osaka native who joined the company in 1971 and served as senior managing director from June 2003 until he became president. In March 2007, Panasonic announced a program that would let 30,000 employees work from home once or twice a week using Internet connections to cut costs. In 2008, the home of company founder Konosuke Matsushita was relocated to the company headquarters as a reminder of the company’s values. Two members of the Matsushita family were in upper management---honorary chairman 95-year-old Masaharu Matsushita and 62-year-old vice president Masayuki Matsushita, Masaharu’s eldest son---at that time. 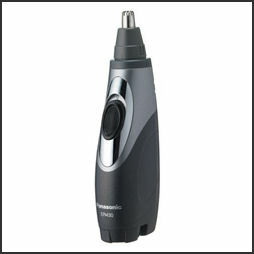 nose and ear hair trimmer In fiscal 2001-2002, Panasonic announced huge loses of more than $1 billion due to sluggish demand for electronics. It responded by laying off workers, closing factories and overhauling product lines. 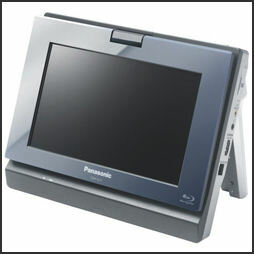 Job cuts and higher sales of DVD players and video camera helped Panasonic post a profit in 2002. Panasonic president Kunio Nakamura was chosen by Forbes magazine as Asian Businessman of the Year in 2003 spearheading the company’s recovery and upstaging rival Sony. Panasonic posted impressive sales figures in 2004 due to demand for flat-screen televisions, digital cameras and DVD recorders. Panasonic profits rose almost 30 percent to ¥281 billion in fiscal 2007-2008 amid strong sales of Lumix digital cameras and flat-screen televisions. Panasonic lost $3.8 billion in fiscal 2008-2009 and $5.3 billion in the April-to-June quarter in 2009 during the global financial crisis and responded by closing13 domestic and 14 overseas production bases in 2009 and cutting 15,000 jobs by end of fiscal 2009-2010. In addition to a drop in demand caused by the economic crisis in 2008 and 2009, Panasonic also suffered as result of competition in the flat screen television sector and decline in sales of digital camera and audio equipment. Vivendi bought Panasonic’s stake in Universal Studios. During the economic crisis Panasonic urged its employees to “Buy Panasonic” with most employees urged to buy products valued over $1,000 and managers and above purchasing products valued at $2,000 and above. The company’s top executives took 30 percent pay cuts in fiscal 2009 to take responsibility for the company’s poor performance during the crisis. In October 2010, Panasonic and a subsidiary of Whirlpool agreed to plead guilty and pay more than $140 million in criminal fines in connection with an international price-fixing scheme. The company had conspired to fix the prices of refrigerant compressors.In August 2010, Panasonic recalled 365,000 refrigerators in China over a faulty temperature control component. Panasonic was hit too bad by the earthquake and tsunami in 2011 as most of its factories were well out of harm’s way. Operations at factories hit by the recent Japanese earthquake were recovering steadily, but disruptions in its supply chain were still affecting output. In April 2011, announced it was cutting 17,000 jobs around the world to reduce costs.Panasonic Corp. plans to transfer part of its parts procurement and distribution functions to Singapore in the first half of fiscal 2012. Sources said Panasonic will transfer about 20 of the 120 employees of its procurement and distribution headquarters in Osaka to Singapore. A base in Singapore will serve as a center for parts procurement abroad. Panasonic also will reduce the number of companies from which it procures parts to about 10,000, down 40 percent from the current level of about 18,000, in fiscal 2012. The company aims to cut annual costs by about 60 billion yen through a central purchasing system, the sources said. Lumix digital camera Panasonic makes a wide range of electronic products and appliances but has recently focused on flat screen televisions and aims to be the world’s largest manufacturer of these products. The company launched the world’s first Blue-ray Disc player-recorder in November 2006. In Europe, Panasonic plans has start selling products like washing machines and refrigerators in addition to audio and video products. The company also plans to push flat screen LCD television sets over 40 inches. Panasonic is making a major push to sell eco products such as energy-saving lighting appliances with florescent bulbs and light-emitting diodes. Panasonic has developed a machine that can identify variations in DNA that it hopes will help doctors ascertain an individual’s reaction to drugs, development of diseases and other health factors by analyzing their genes. Panasonic plans to invest over $1 billion in its solar business over six years between 2010 and 2016. The company hopes its merger with Sanyo will help it become one of Japan’s top three solar panel producers. Panasonic entered the smartphone market in 2011 using the Google Android system. In June 2005, Panasonic introduced Oxyride which it claimed were the greatest advancement in batteries in 40 years. They are priced the same as regular alkaline batters ($4 for four) but last as much as twice as long as premium versions like the Duracell Ultra. Not only that but they deliver more power. A New York Times journalist put the battery through a series of test at home and found the claims were true. His flashlight produced more light and his portable screwdriver and fan spun more quickly with the new batteries. Panasonic hopes these batteries will help it claim a bigger share of the U.S. market. A In September 2011, Kyodo reported that Panasonic Corp. said three humanoid robots powered by its Evolta batteries will stage a triathlon race on a Hawaiian island. In the race which will start in October Panasonic aims at enabling the robots to complete the 230-kilometer triathlon within a week by repeatedly charging their batteries. The three robots, 23 to 51 centimeters wide and 21 to 26 cm high, will take part in swimming, cycling and marathon events, respectively.robot powered by a Panasonic Evolta batteries has climbed a 530 meters section of the Grand Canyon using a rope in six hours and 46 minutes and has run for 24 hours on the Le Mans race course in France. Panasonic is a major producer of rechargeable. lithium-ion batteries used in cell phones, I-pods and other portable electronics. In July 2008, it announced plans to build a $1 billion plant to produce these batteries in Osaka. The plant will open on 2009 and by 2011 produce 600 million units a year. In August 2007, Nokia said it would replace 46 million Panasonic-produced batteries in its cell phones free of charge because of concern the batteries might overheat. In 1996, Toyota and Panasonic formed a joint venture---Panasonic EV Energy---to produce nickel-metal batteries for hybrid cars. The company is world’s largest producer of nickel hydrogen batteries and is a major maker of lithium ion batteries for next generation hybrid cars, which can be electrically charged at home. Panasonic EV Energy broke ground on a new plant in Sendai in November 2008. Toyota is one of the largest holders of Panasonic stock. In December 2009, Panasonic announced that it had developed a stronger lithium-ion battery that can be used in everything from laptops to electric cars. It also announced plans to begin selling a home-use storage cell in 2010 that can store enough electricity for one year of use. As of 2010, Panasonic had produced 150 billion batteries since it made its first ones in 1931. If these batteries were lined up end to end they would circle the earth 180 times. Panasonic produces batteries in 111 countries including Tanzania, Thailand and Poland. In December 2010, Panasonic said it would sell cheap air conditioners in India. In September 2004, Panasonic joined Hitachi and Toshiba on $1 billion deal to make Liquid Crystal Display panels for flat screen televisions. The plant was expected to start production in September 2006 and produce 2.5 million units a year by 2009. In February 2008, Panasonic announced to would build a new $3 billion plant in Hyogo Prefecture to produce liquid crystal display panels. Construction began in August and 2007 and the project is expected to be finished in January 2010. The plant will be able to produce 15 million 32-inch LCD panels a year. Panasonic, Hitachi and Canon are considering forming an alliance to develop organic, light-emitting display technology. Panasonic is the world’s top seller of plasma televisions, with 26 percent of the global market in 2005. It began selling a 65-inch plasma that year for under $10,000. South Korea’s LG and Samsung are its closet rivals with 15 and 13 global financial crisis in 2008 and 2009 shares respectively. Hitachi, Pioneer and Sony have less than 10 percent. Panasonic plans begin selling a 150-inch plasma television---the world’s largest---in 2009. Displayed at the Consumer Electronic Show in the United States in 2008, it is roughly 2-x-3½ meters, big enough to display a full size adult. As of 2008, a 103-inch Panasonic-made plasma television, which sells for about $50,000, was the largest television on the market. Panasonic has been raising its plasma capacity. In January 2007, it announced it would invest $2.3 billion to build the world’s largest plasma display factory, mainly to supply the flat screen televison market, in Amagasaki in western Japan. It was expected to be producing at full capacity in May 2009, producing 12 million 42-inch panels a year, but those plans were dashed by the global financial crisis in 2008 and 2009. The size of the factory should give Panasonic a significant economy of scale of advantage. The ¥235 billion Hyogo LCD plant was completed in June 2010. Panasonic and Samsung are expected to be the first to release 3-D televisions in the United States, in the spring of 2010. In the autumn it plans to begin marketing the world’s largest 3-D plasma television, a 152-inch television that projects stereoscopic images on a 1.8 meter-high, 3.4 meter-wide screen, large enough to display life-size figures. Plasma offers better images for 3-D than high definition televisions because it create less afterimage and has better moving picture resolutions. Panasonic is marketing the devise as a means to advertise homes, cars and other expensive products at trade shows and other special occasions. Panasonic has also developed a 50-inch, 3-D plasma television for home use. In March 2010, Panasonic began selling 3-D televisions in the United States through its partnership with Best Buy. Selling for $2,599, the 50-inch, 3-D plasma set comes with a Blue-ray players and one pair of 3-D glasses. The same sets were introduced in Japan the following month. Panasonic hoped to sell 1 million 3-D televisions in 2010. 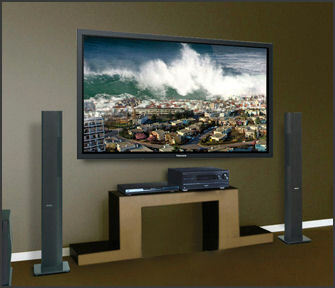 In April 2009, Panasonic introduced the world’s first high definition televisions capable of 3-D images along with variety of Blue-ray disc players capable of copying and recording and playing 3-D images, The televisions have 50 inch and 54 inch screens and sell for about $5,000 and $6,000 respectively. In July 2010, Panasonic introduced a 3-D camcorder. In August 2011, Panasonic, announced the commencement of a first-of-its-kind test-bed of total energy solutions in Singapore. This test-bed project will see Panasonic utilise and integrate its energy creation, storage and saving solutions at an existing public residential building to realise greener lifestyle. The project will commence this year and will run till 2013. The test will be conducted at the Punggol Eco Town, which has been marked as one of the key “living labs” for urban sustainability solutions in Singapore. In collaboration with in partnership with the Housing & Development Board (HDB), Energy Market Authority (EMA) and the Singapore Economic Development Board (EDB), Panasonic will install its photovoltaic systems to supply renewable energy to power common facilities such as the lifts, water pump and lighting, aiming to challenge zero emissions target. Panasonic will also introduce its lithium-ion battery to store excess electricity generated by the solar panels for use at night and to serve as a backup electricity generator. It also plans to increase energy efficiency in the households by installing its Home Energy Management System (HEMS) in participating units in the block. This helps the households to monitor their electricity, water and gas consumption patterns via in-home display and better manage their energy consumption. 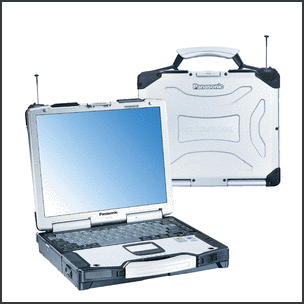 Toughbook computer In the mid 2000s, Panasonic acquired 70.5 percent stake of Sanyo by paying ¥131 a share to three major stockholders--- Goldman Sachs, Daiwa Securities and Sumitomo Mitsui Financial Group . It was the largest acquisition in Japan’s consumer electronic industry. Panasonic plans to make Sanyo a subsidiary. Panasonic owns JVC, which loses money. Panasonic took full control of Sanyo in April 2011. In July 2010, Panasonic announced it was going to buy out Sanyo Electric Works and Panasonic Electric Works and reduce redundancy within the subsidiaries as part of an overall strategy to become leaner, meaner and improve brand strength and global competitiveness. Panasonic plans to keep the Sanyo brand name on some of its best-selling products. Sanyo last money in 2009 after originally projecting to break even because of losses due to a washer-dryer recall and early retirement program. In December 2010, JVC Kenwood planned to get a hold of enough capital so that it could leave Panasonic group’s umbrella as Panasonic stake in the company would be reduced from 28 percent to 20 percent. In July 2011, it was announced that China's Haier will buy Panasonic Corp's Sanyo Electric washing machine and refrigerator units in Japan and Southeast Asia for about $130 million, in a move that will give the Chinese appliance giant better access to Japanese markets.